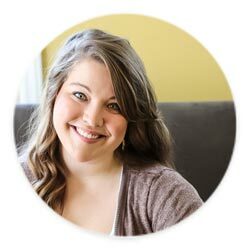 Think keto and casseroles can’t go together? Think again! 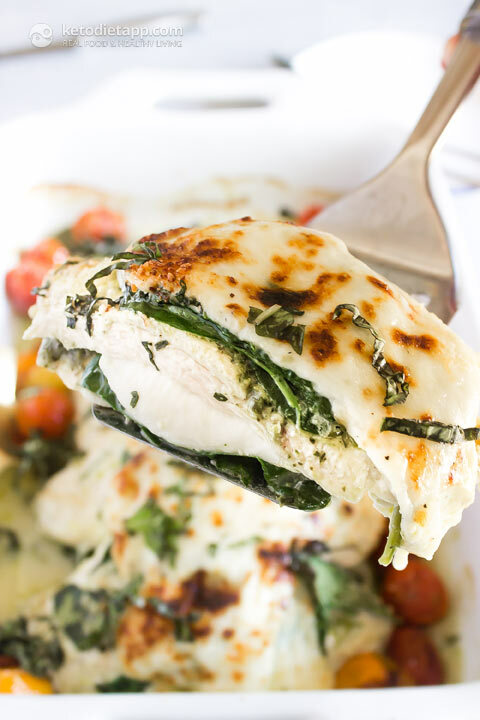 This low-carb friendly casserole has layers of tender chicken, cheesy mozzarella and parmesan, tangy pesto, spinach, and roasted cherry tomatoes! Doesn’t that sound amazing? This is a super easy recipe that will please even the pickiest of eaters, even the ones who don’t normally eat keto. How could you go wrong with cheese and chicken? And when I say easy I mean really easy. 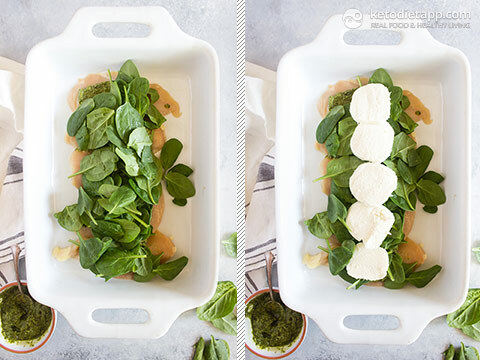 All you have to do is layer the chicken cutlets into a large casserole dish, top with pesto, spinach, and mozzarella then top with another layer in the same order. After that you’ll add the cherry tomatoes to the sides and sprinkle with some parmesan and bake until bubbly. For a complete meal I would serve this with a green salad and an Italian vinaigrette. Note: Using chicken thighs instead of chicken breasts will decrease the protein and increase the fat content per serving. If using skinless and boneless chicken thighs: 47 g protein, and 31 g fat. ... half the spinach, and half of the mozzarella. Repeat with another layer. 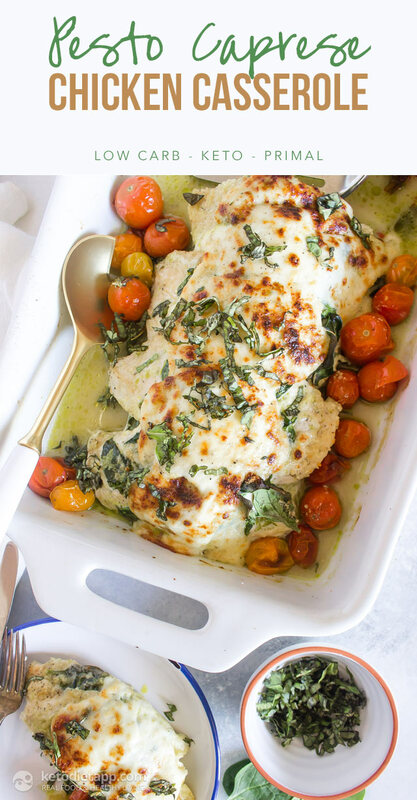 Top the casserole with the parmesan cheese and add the cherry tomatoes to the sides. 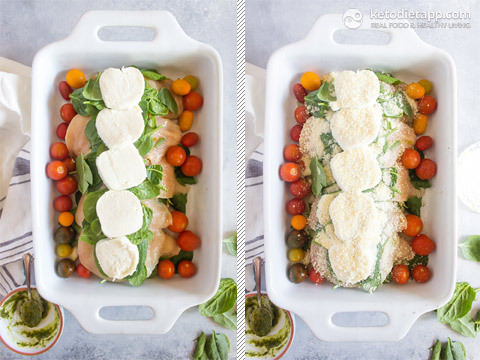 Bake for 45-50 minutes (Update: based on feedback, cook for 40-45 minutes) or until the chicken is cooked through and the cheese is golden and bubbly. If you’d like you can place the casserole under the broiler for 3-4 minutes to crisp up the cheese at the end. Sprinkle with fresh basil and serve. To store, let it cool down and keep refrigerate for up to 4 days. May I omit the spinach or use an alternative? Absolutely! You could use any other greens such as collards, chard or kale. Ot use sliced zucchini or eggplant. Any veggies will work. Just beware that if you use broccoli, the florets may burn. 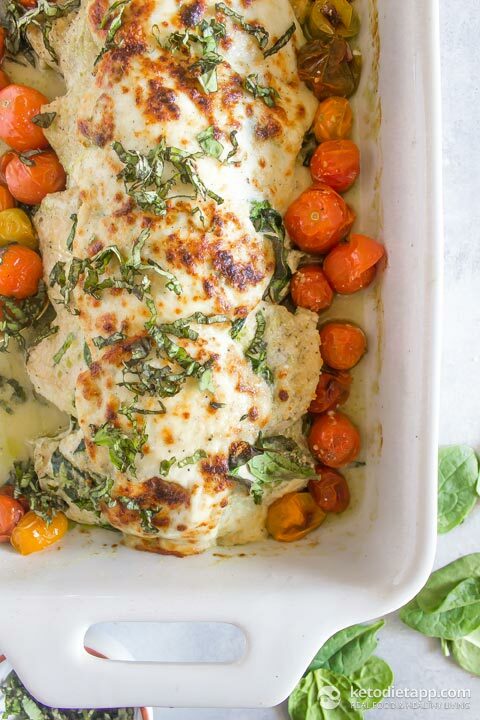 Can I make this the day before and then reheat it in the oven the next day? If so, what temp and time do you recommend. Hi Jessica, yes you can reheat it in the oven. I reheat mine at about 150C (300F) for about 10 minutes. I’m new to Keto and want to package each serving separately after baking for convenience and portion control. The pan showed 5 breasts, how do you make 8 servings from that? No coffee = can't think - so true!!  That's a very good point! I think you'll have to cut them or use smaller chicken breasts so they add up to 3 lbs meat. Should this be the considered a meal or should we pair with a side dish? If yes, any side dishes suggestions? What is the calorie amount? Sure wish the printable version of the recipe had an option to leave out pictures. The recipes turn out to be about five pages with pics. Once we’ve done the recipe once by looking at it on line, we don’t need pictures again. I'm not sure why you see images? The "print recipe" option at the top of the page does not include them. I just tried it and only got 2 pages and no images. You can tell your printer which pages to print in the column below the # of pages. If you want only #1 & #6, place the numbers in the pages box. Mine was really watery, not sure what I did wrong. 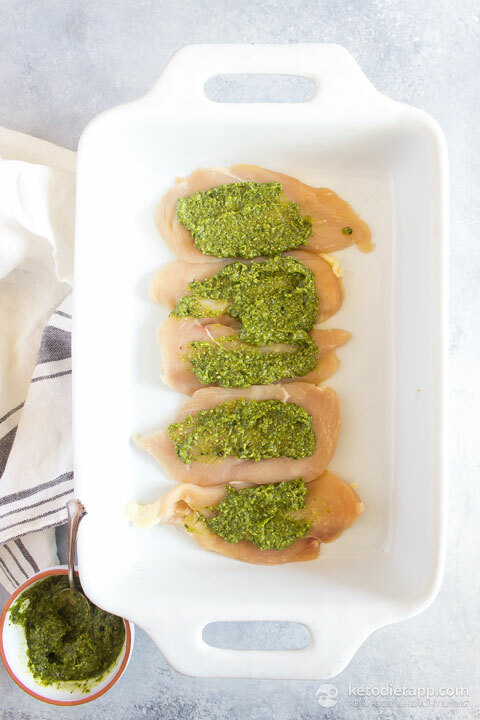 I can't wait to try this recipe- AND the pesto recipe. Buying ingredients tonight! 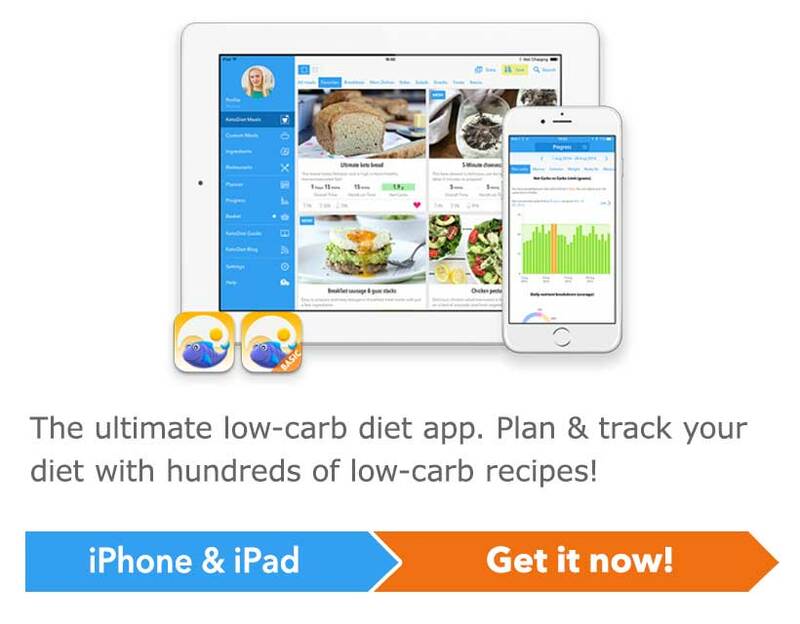 Thank you for typing in your "updates" to the recipe based on user input. That is super helpful!! Another great recipe, it was delicious! Yes, this kind of casserole should freeze well. The "make your own pesto" link only leads to this very same page. It doesn't lead to a pesto recipe. I tried several times & wind up back on this Parmesan chicken recipe. Thank you Sharon - fixed! why is there not a printable version?????? There is - you just need to click on "print recipe". Made this tonight for dinner and everyone loved it. So quick n easy yet oh so tasty! Can't wait until basil is back on season so can use fresh homemade pesto! Only thing is we found oven was too hot at 220c and it way overcooked the cheese mix on top. Next time will preheat oven to 220c then reduce to maybe 180c for the cooking time. Thanks for another wonderful recipe! I agree, the temperature was a bit too high. I also ended up burning the cheese on top, but ate it anyway because burned cheese is still edible as long as it's not black ;) The dish itself was terrific and everyone loved it. Thank you for your feedback - I'll add this as a note in the recipe!